-Dr. Shawn Haseley, Co-Founder Revolution H.Q. Save 15% and get your energy boost along with all the nutrients and minerals you need to keep your body functioning optimally throughout the day with B12 and our Everyday Essentials Daily Vitamin! 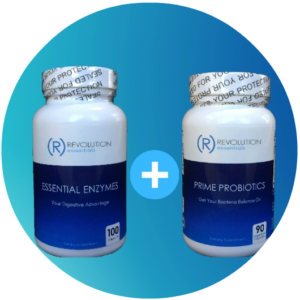 Save 15% on our Probiotics and Essential Enzymes when purchased in our Digestive Health Pack. Save 20% on the Power Pack! 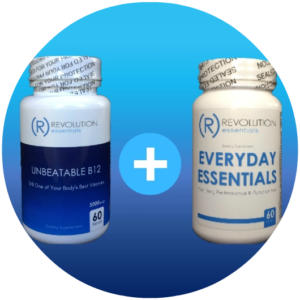 Our most popular combination purchase to date includes Unbeatable B12, Prime Probiotics and the Everyday Essentials (Daily Vitamin)! 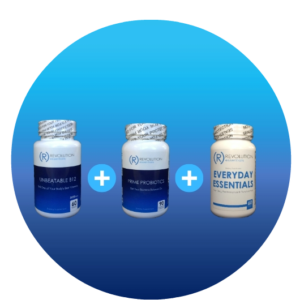 These three super supplements provide incredible nutritional support, energy, focus, and digestive health. Taken regularly, an overall health improvement will be seen in no time at all.